“Stephanie’s contribution to the firm has grown leaps and bounds since she joined us years ago. We are excited that she has developed her expertise to take her career to the next level,” said Principal Jonathan Frutkin. This month, the Frutkin Law Firm has announced Stephanie Fierro, Esq. has been named Senior Counsel Attorney at the Firm. Fierro serves clients in general counsel business law and estate planning. She also has experience in business litigation and alternative dispute resolution inherent in any general counsel practice. She brings the firm a wide range of experience and interests including all aspects of corporate transactional work, estate planning, and tax representation. Before joining Th e Frutkin Law Firm, PLC, she managed her own law practice, Fierro Law, PLC. Fierro graduated from New England Law | Boston in 2005 with honors and was awarded the President Anna E. Hirsch Award for service to the law school and the Dean’s Award for making a unique contribution to the school. She earned her Bachelor of Science degree from Arizona State University in 2002. 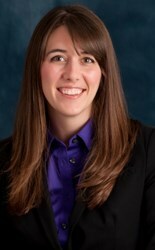 Stephanie currently serves as an alumni mentor for students of New England Law | Boston. Fierro is very involved in the community and has served on many not-for-profit boards, including serving as a Board Member for the Ahwatukee Foothills Chamber of Commerce. Stephanie is currently working with Hospice of the Valley as a volunteer on the committee for their AAHA!, An Auction of Heirlooms and Art event. In 2013, Fierro was named among the top business and corporate lawyers in the state by Arizona Business Magazine. She has previously been the contributing editor for Attorney at Law Magazine and Public Accountant Magazine. As a part of her role with the firm, Fierro appears on local news stations to discuss a broad range of timely legal topics which have included the Affordable Care Act, Estate and Tax Planning and Pinterest to name a few. The Frutkin Law Firm, PLC was founded in 2007 by attorney Jonathan Frutkin with the goal of providing exceptional legal representation to clients throughout Arizona in business and corporate law and related areas, ranging from taxation and asset protection to estate planning. The Frutkin Law Firm helps businesses, individuals, and families throughout Arizona with their corporate and business law, bankruptcy, taxation, asset protection, wills, trusts, and estates, and litigation needs. The firm is located in North Scottsdale. For more information, visit http://www.frutkinlaw.com.